Welcome to Fall! Finally! Summer seems to last forever in Texas, but the days are finally turning cool. In honor of the arrival of fall this month's block drive for Covered in Love will be a falling leaves block. First off, I didn't invent this block, I've seen it lots of places. I just customized the measurements for our purposes. 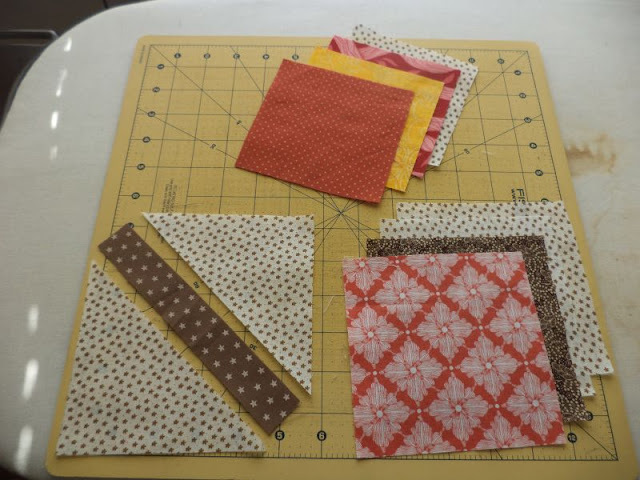 To make this block you will need some scraps in fall colors (brown, red/maroon, orange, yellow) and scraps for the background in khaki/taupe/off white shades. 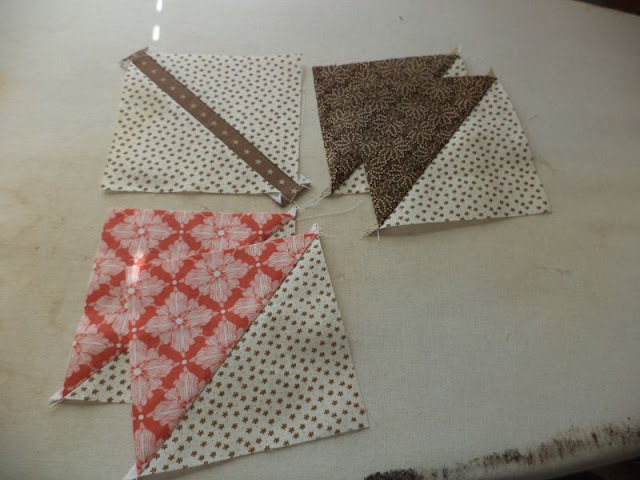 On the back side of the (3) 5" background squares mark a diagonal line corner to corner and slice one of the squares along that line into 2 triangles. Sew the brown strip in-between the two triangles to reassemble the square as a "stem" unit. Pair the other (2) 5" background squares with the 5" colored squares and sew on either side of the marked line, then cut to yield 2 HSTs (tutorial #1 here). 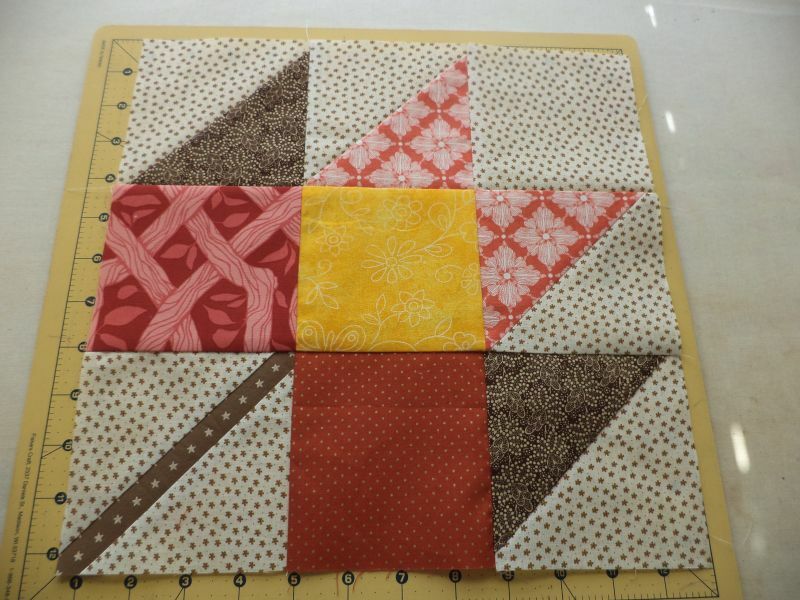 Press and trim the (4) HSTs and the "stem" unit to 4.5" square and lay out the block as shown. If you are making more than one block at once you can switch around your HSTs to have more variety within each block. Also, I used the same fabric for the background throughout this block, but feel free to keep it scrappy! 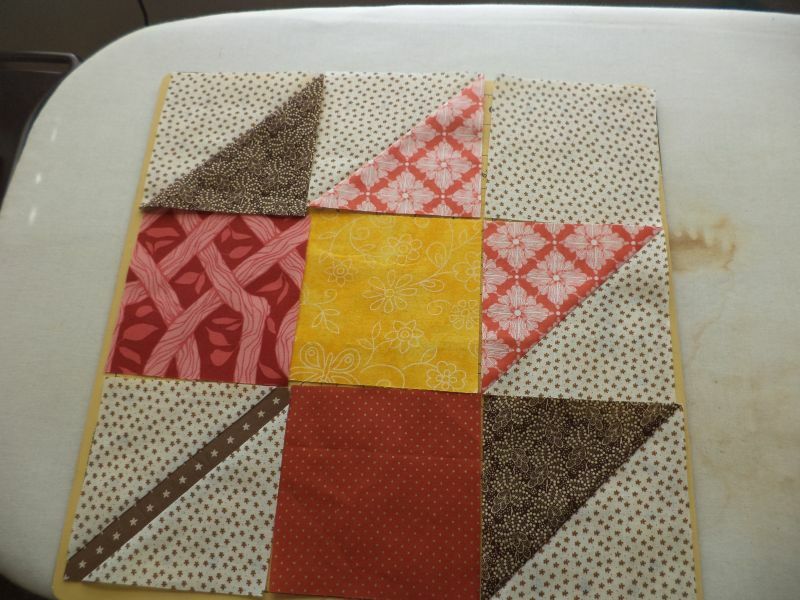 Sew together your 9 small blocks into a 12.5" finished block and you're done! Comment or send me an email for my mailing address if you want to pitch in. Make 1 block or 10, all donations are welcome! Covered in Love makes quilts of comfort to be given to the families of patients who pass away in the hospital where I work. These quilts not only bring warmth to a hospital room, but are taken home by the families as transitional items. Check out our August block drive quilt by clicking on the picture above. Linking to Oh Scrap! and Design Wall Monday. 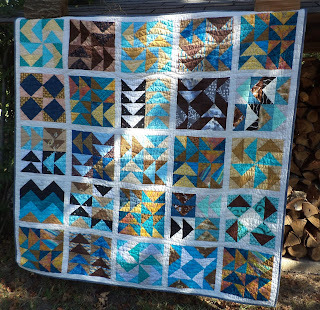 The August quilt is GORGEOUS! Looking forward to making a few autumn leaves (since last winter my Bradford pear tree's leaves didn't turn color until JANUARY - comes with living in the sub-tropical desert that is Houston!). Love your leaf block! I will look through my stash for fabrics to make a few, as I seem to have totally missed the month of October! The leaf block is a perfect choice for fall. The quilt is going to be lovely. Thanks for sharing with Oh Scrap! Leaf blocks have been on my mind lately. Love yours. And the quilt is so pretty. Quilts are a great comfort. Your blocks is perfect for the season and for a good cause. Have a wonderful week. Love your leaf block. I know this is the first week it's actually felt cool! I would like to make a couple and send them to you, email me at gavinsmommy2307@Gmail.com with your info if interested. Love to help! Email me your address and I'll get 1 in the mail Saturday.